A Celtic Dragon bites the chain of this beautifully detailed pewter Thors Hammer necklace. 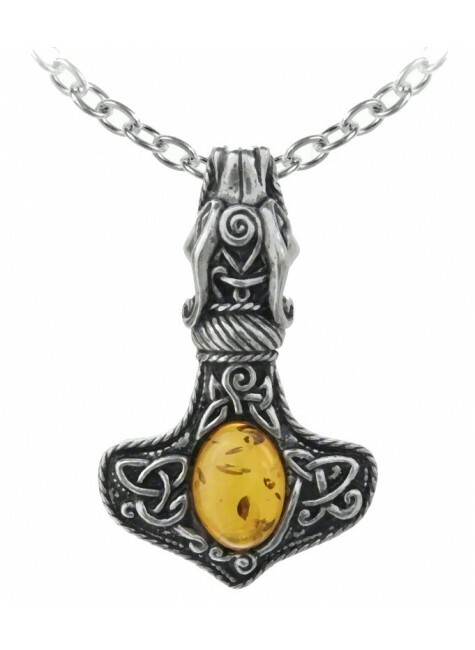 A classic, ornate and highly intricate amulet of power and protection, fit for a high ranking Saxon or Viking leader/warlord. The head of a Celtic dragon has been sculted to bite the chain that it hangs from. 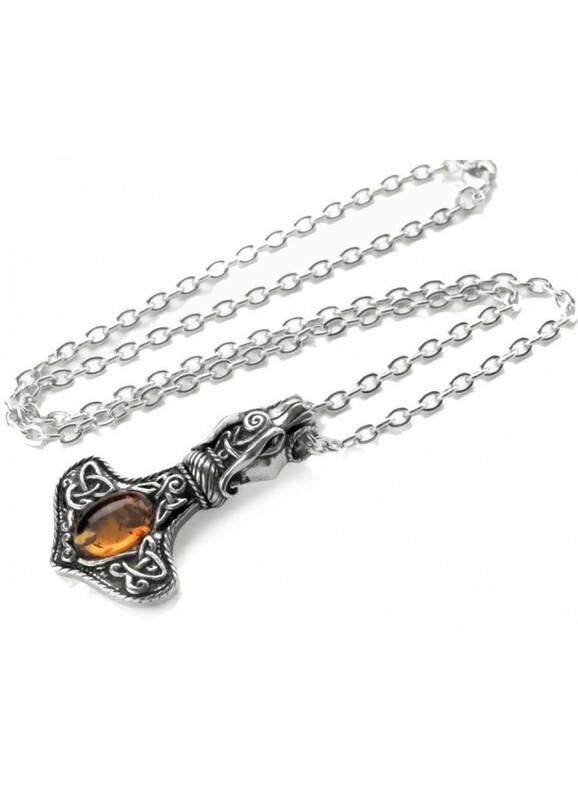 Celtic knot-work embellishes this hammer and is set with a highly-prized, polished translucent, genuine amber gemstone (Allowing natural flaws to be seen against the light). Amber is a resin and is water soluable, so do not wear swimming or in long contact with water. 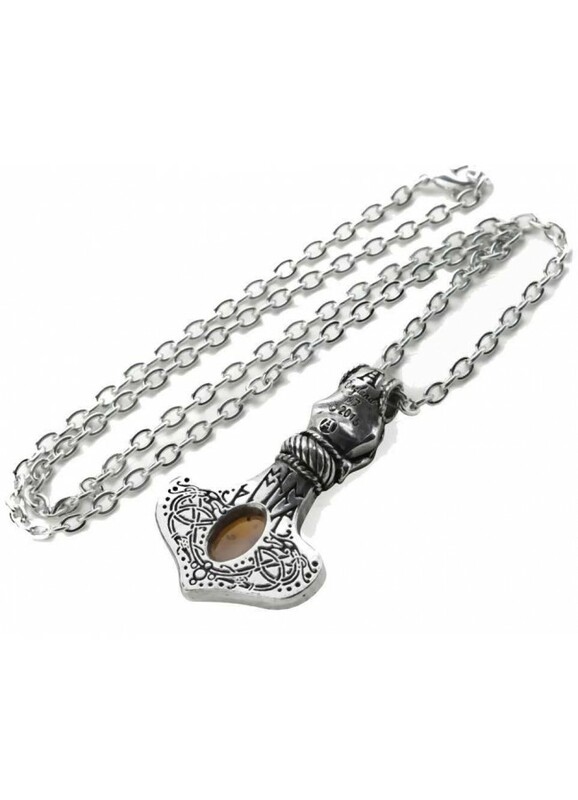 Pendant is 1.89 inches long and comes on a 21 inch long nickel-free silvertone chain with lobster claw clasp. Item Number: AG-P728 | Approximate Size (Inches): 1.18 wide x 0.43 deep x 1.89 high | Approximate Shipping Weight: 1.00 lbs. Pewter Thor's Hammer ring. .. Finely detailed pewter gothic belt buckle in pewter is ornately detailed..
Black leather bracelet is mounted with a pewter Thors Hammer. Wonderfully d..
Amber Amber is fossilized tree resin which is known for its honey golden color and inclusions that can contain fossils and small insects. Much valued as a gemstone, it is also used as an ingredient in perfects and for healing in folk medicine. Amber is water soluble and should not be cleansed with water or worn while swimming or bathing.